Thinking of revamping your outside space? 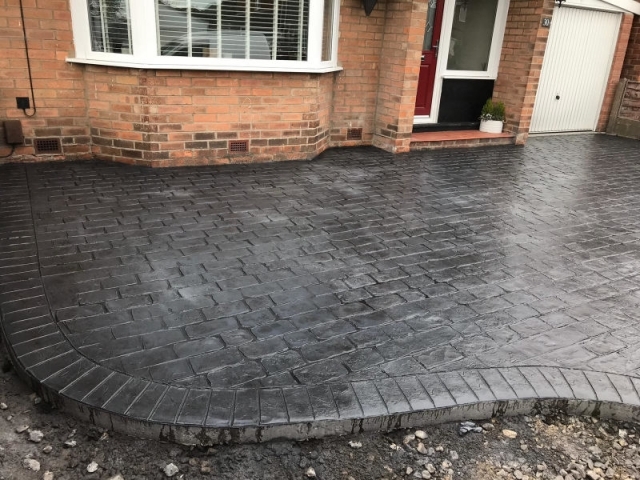 A new driveway in Flixton is a brilliant way to improve the whole appearance of not just the area at the front of your house but also to enhance the look of your property too. You can create a stylish focus as well as a practical but attractive area to park your cars. It’s also an opportunity for you to add a personal touch to your property and make a major statement at the same time as it’s the first thing that people see. Don’t worry if you are not sure what would work or look right, at Lasting Impressions, we can help you plan and design your driveway and advise you on the appropriate options available for a concrete driveway in Flixton. 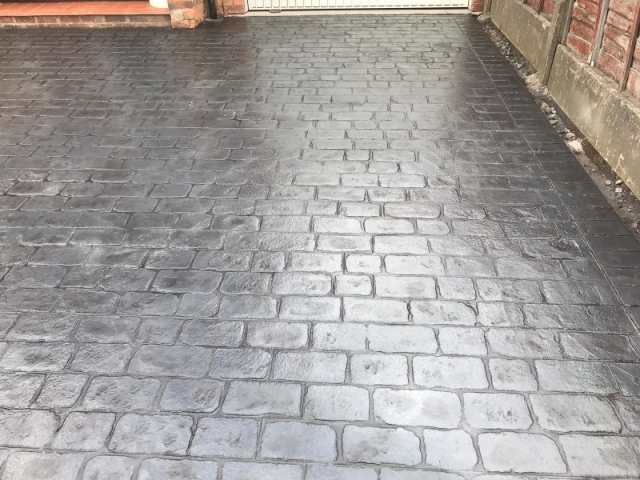 Our clients in the Flixton area of Manchester decided to have a pattern imprinted concrete driveway in Cheshire Cobble and coloured in Classic Grey. If you want to see what this looks like, see the photographs included for the end results. The driveway was across the full length of the house leading up to the front door and garage. It also allowed for a lovely sweeping curved planter which we were able to shape by using flexible shuttering. It’s these extra details that define Lasting Impressions and are evidence of our years of experience learning the craft of installing professional pattern imprinted concrete driveways and it’s this attention to detail that creates a superior finish on all our projects. 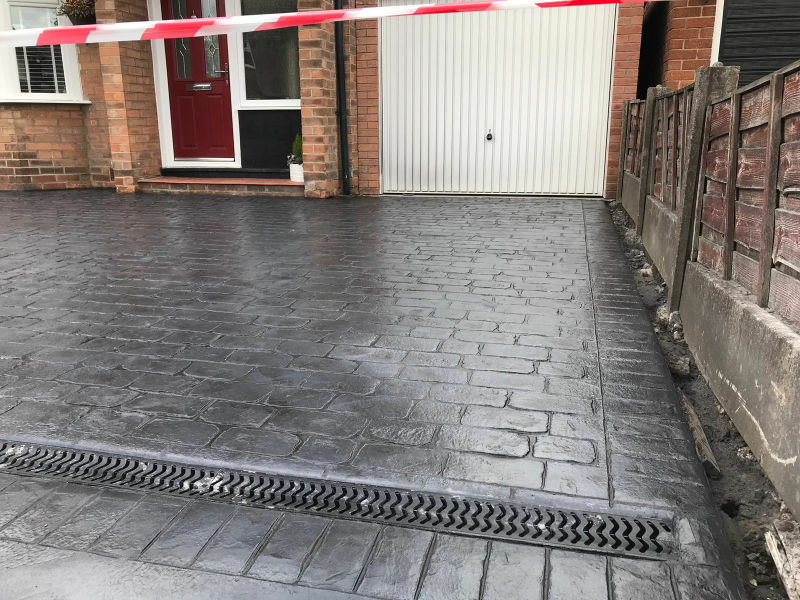 An ACO drain was installed on the new driveway in Flixton, this allows surface water to drain off rather than collect on the driveway. You can see the drain running across the front of the house near to the footpath from the photographs included. The new driveway in Flixton was finally sealed with a mid-sheen seal with anti-slip as well as an ACO drain installed which allows surface water to drain off rather than collect on the driveway. You can see the drain running across the front of the house near to the footpath. If you are thinking of having a new concrete driveway in Flixton contact Lasting Impressions on 0161 980 8822.